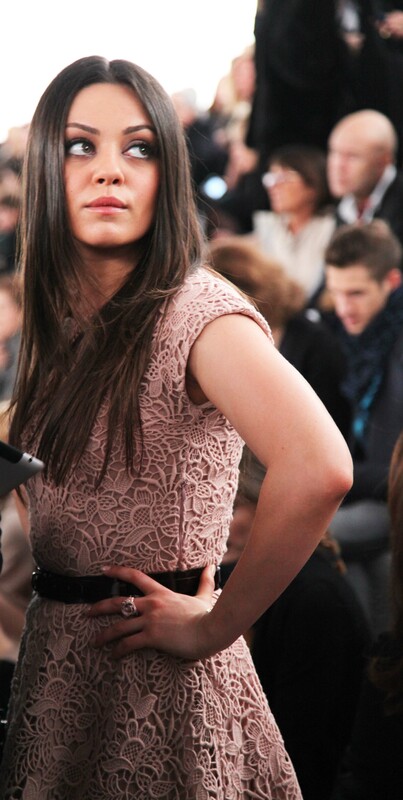 Here is Mila Kunis at the Christian Dior Fall Winter 2012 show. Kunis is the current spokes person for the Lady Dior bags, taking the place of Marion Cotillard, if you see the ads they look alike in the photographs, I don’t know if it is in purpose. In real person they are very different, Mila has a very unique beauty, almost like a doll face, but a little stuck up comparison to other stars that are more famous (Uma Thurman, Alicia Keys, Lic Tyler) so I would not say she is my favorite, but I stole this moments at the show which I think they are cool because they are no poses and still they were not crazy paparazzis blocking my way…and, that pink dress is just magical.